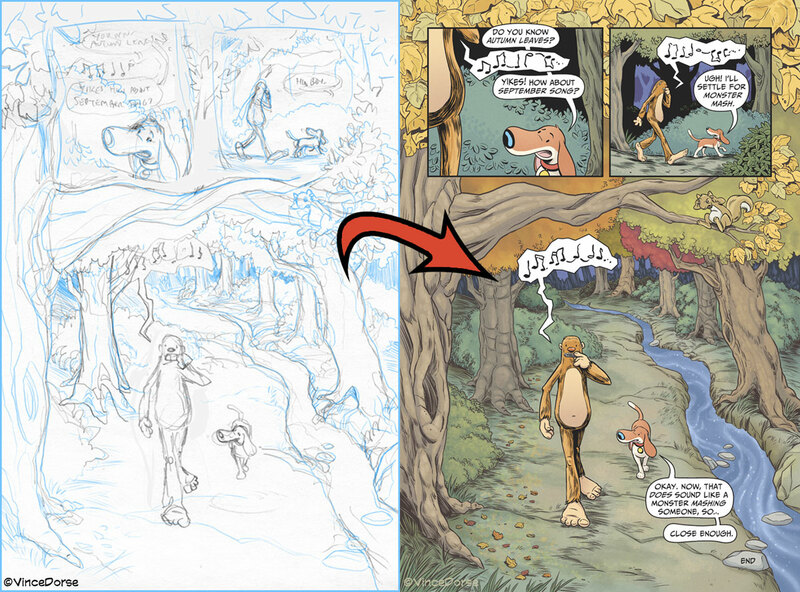 My Comics Process: Pencils, Inks, Colors. 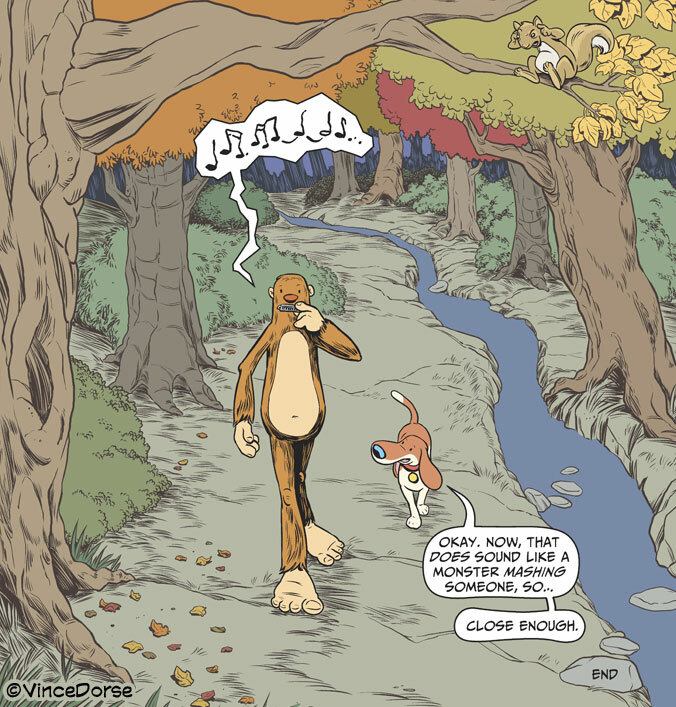 I just finished up a 14-page Untold Tales of Bigfoot short (you can read the whole thing from the start right here) and this last page (spoilers?) was a lot of fun for me, so I thought I’d break down my process here. I’ll be taking you from the initial pencils all the way through the final colors, and noting my tools/apps as I go along. So if process is your kind of thing, read on, friend. 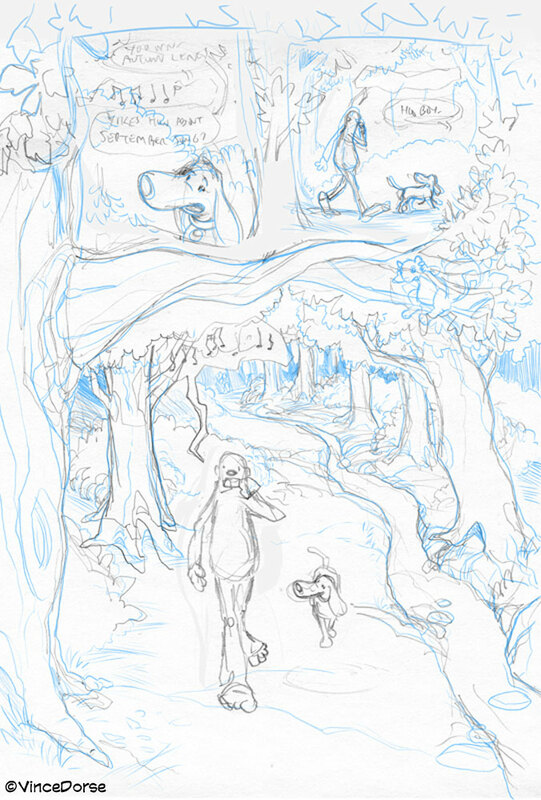 This looks like an unholy mess because it’s my scanned pencil roughs covered in digital scribbles (done in Clip Studio with the Blue Layout Pencil). The pencils were my rough, stream-of-consciousness plans for the page. The blue pencil is my attempt to clean those ideas up and define what I really want. Inks are done in Clip Studio. For stuff like this, I use the G-Pen (comes standard) or any one of a handful of custom brushes you can find online (Ray Frenden has a few nice collections for sale). 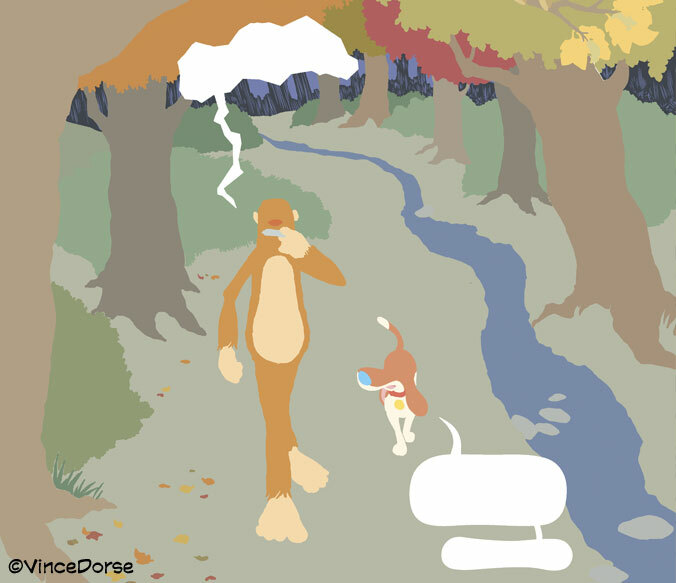 Since this was the final page of the short, I wanted to end it with a big, splashy image. 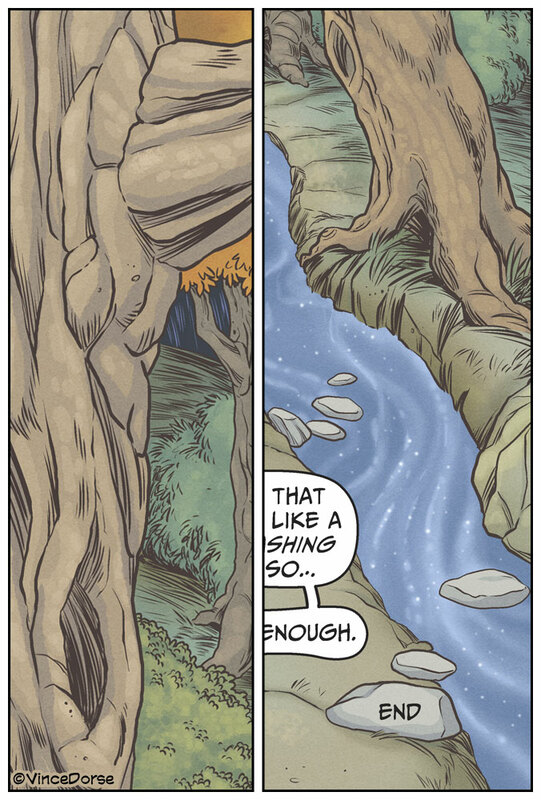 So the dominant illustration of the forest stretches out over all the edges of the page, full-bleed. 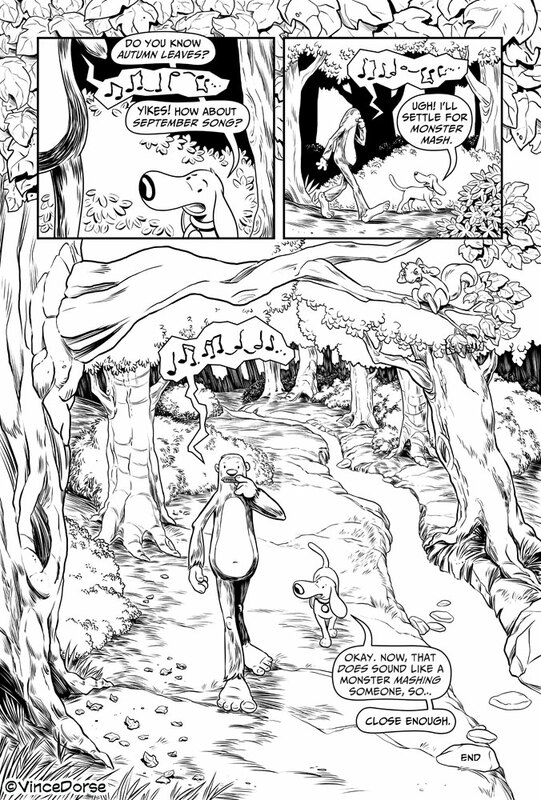 Here’s the entire page, inked (the top two frame borders were made using the Rectangle Frame/Divide Frame tools in Clip Studio). Next step is flat color. Until Clip Studio has a proper CMYK space, I’m coloring stuff in Photoshop. I’ve also been experimenting with Affinity Photo (one of the few digital art platforms that boasts a CMYK workspace), but I’m not adept enough at Affinity Photo for a job like this, so off to Photoshop I go. There’s a few different ways to flat, but for my purposes, since I’m the one doing the finished colors, I just go in with a hard, round brush, opacity at 100%, pressure sensitivity turned off, and I lay in the base color of the objects. If you’re flatting for someone else, you may want to explore the lasso tool/fill method (select your shape with the lasso tool, fill with flat color, repeat), since that’s a pretty reliable workflow. But my approach works fine with this project for my workflow. With some techniques, you can drop in any random color during the flatting process, and then change it with a simple fill later. 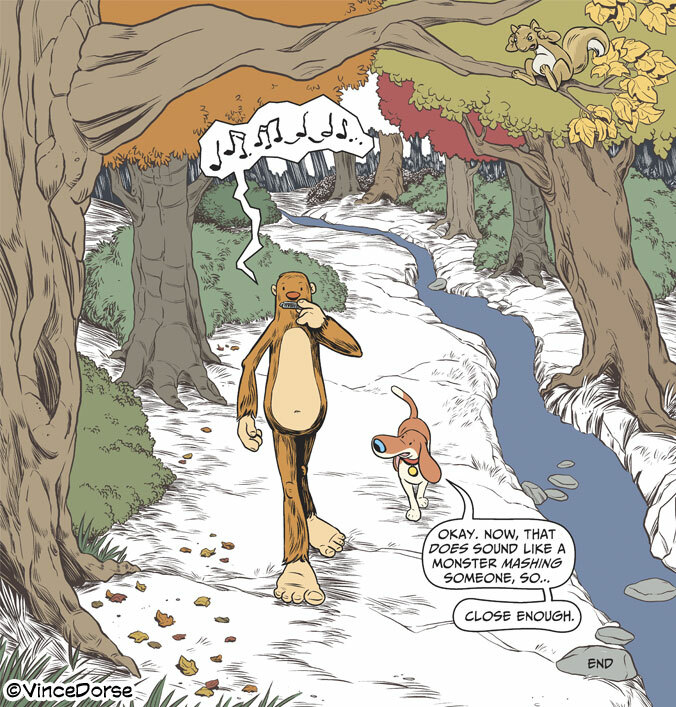 But since I have a color palette set up for my Bigfoot comic, I start with the actual, proper color, saving me a step. Whichever method you end up using, just try to make sure there isn’t any gapping between the colors of your flats. If the ink plates shift even a little during printing, you could end up with some sloppy looking white space peeking out from beneath your linework. So check your flats and clean up any gapping before moving on to the detailing. This part’s more fun than flatting, but it’s also all over the place with technique and tools. So I’ll just highlight some of the stuff I do to model the forms. Still in Photoshop, I bounce around between tools to help me achieve the lighting and texture I’m looking for. 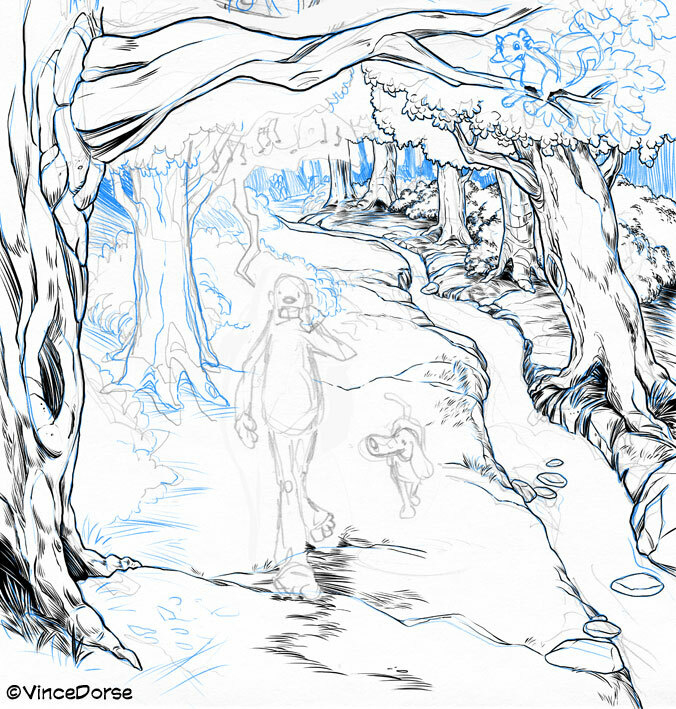 Sometimes I’ll use a hard-edged brush at 40-50% opacity to build up things like tree bark or model the foliage, other times I’ll use the hard-edged pencil tool to carve some shadow into rocks. I think I used a custom texture brush on the ground to give it an irregular, dappled look. And in the water, I experimented this time with a combination of hard-edged and soft-edged brushes. I like the way it came out, so I’ll probably mess around with that technique again in the future. So here are all the steps, animated in this gif. I approach most of my comic art in a very similar way, sometimes simpler, rarely more elaborate. But I’m always scouring the internet to find new ways to experiment. Anything that’ll help me make my comics better…or faster — optimally, both — I’m willing to try it. Very cool. I liked how you demonstrated your process. I have been trying to do everything in CSP. I don’t hardly use my sketchbook anymore. I wonder sometimes if I am limiting myself though. I have had a lot of really great designs start from just a pencil and paper. I agree. I bought myself a small sketchbook with the plan of using it as a project book for devoted to one comic…character concepts, breakdowns, storyboards, etc. I am discovering my own style and best workflow practices daily it seems. My biggest shortfall is rushing through my work. I was thinking about it yesterday and maybe dusting off my sketchbook would force me to focus on the design construction more. Do you ever think you work too fast? I am my worst critic but I see some lost opportunity in some of my designs. 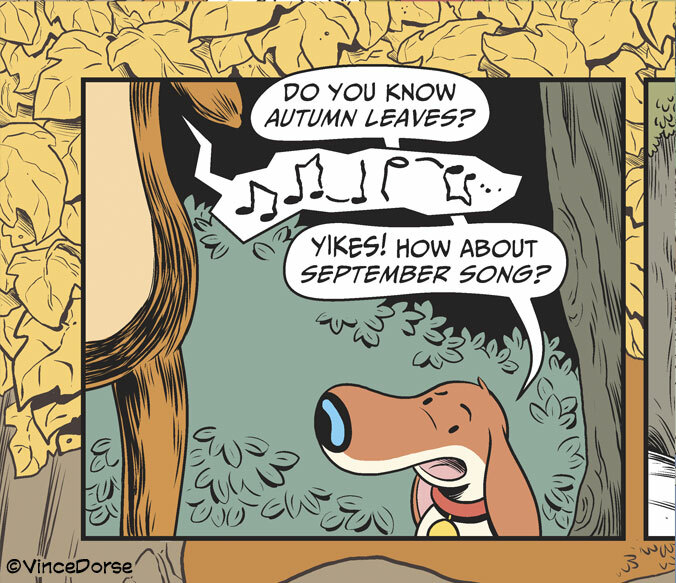 Brilliant Vincedorse. You don’t fancy illustrating my next children’s book do you? Thank for sharing. Glad you like it. I always enjoy looking at other people’s process. You learn something new every day. Flattered to be asked to work on your next project, but I’m usually pretty booked up. Still, when you’re ready, feel free to contact me at vincedorse.com with your proposal. I’m always taking commissions and other jobs….it’s how I finance my bigfoot habit. : ) Have a great holiday! Thank you for your reply, I’ll see how you’re fixed when I’m ready. Have a terrific holiday.